When it comes to dessert I´m pretty partial to chocolate, especially in February which is basically an entire month devoted to all the chocolatey things. And deservedly so. But I´m also a huge fan of Meyer lemons in baked goods and they happen to be in season now. Truth be told, if I´m not indulging in a chocolate something or other, you´ll find me puckering up for a slice of lemon anything. I´ve been making lemon bars for years, ever since my citrus loving better half planted our very first Meyer lemon tree in the backyard. Every January our tree would be bursting with bright and juicy lemons which meant you could find me in the kitchen baking lemon bars on repeat. 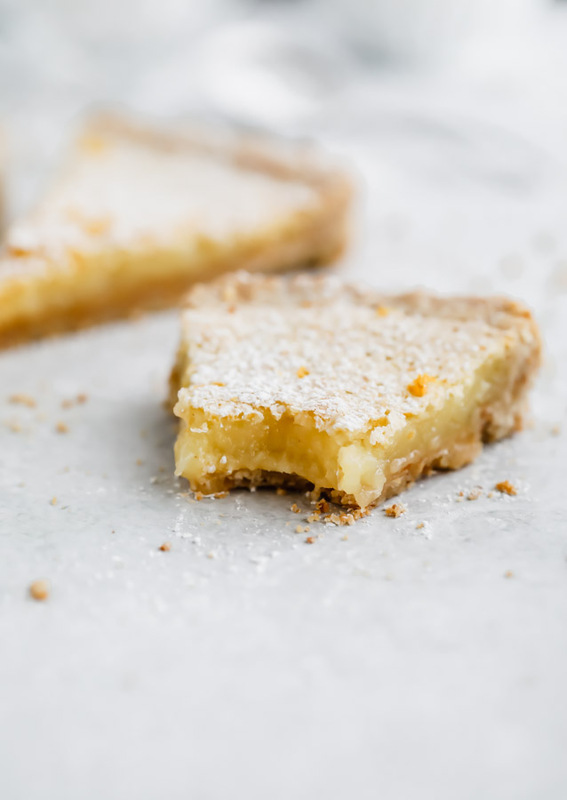 When life gives you lemons, skip the lemonade and make lemon bars. I will say lemon poppyseed cake is also a good choice, you can find that delicious recipe here. I was hosting a dinner party a couple of weeks ago and had a bunch of bright and shiny Meyers fresh off the tree. 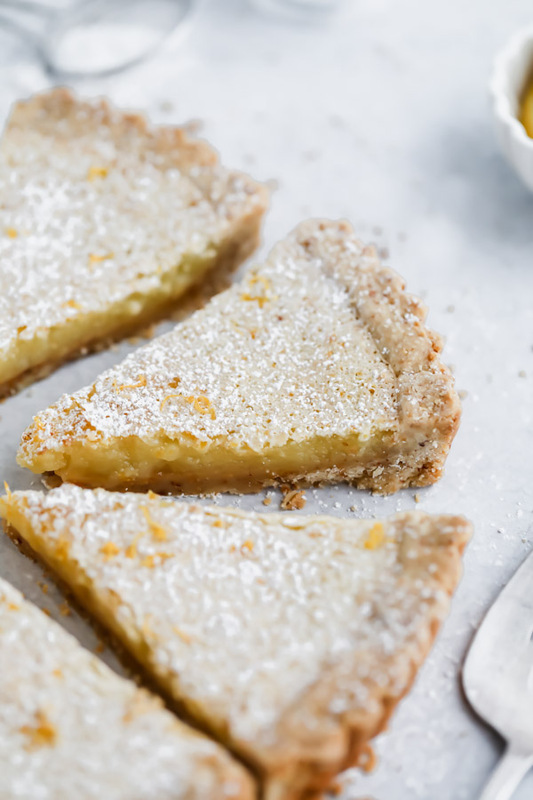 I decided to kick my traditional lemon bars up a notch and make them into a tart. I´m not so sure what took me so long to come up with this genius idea. I may never make a regular lemon bar again. This tart is just as easy and it´s a beauty with that pretty fluted edge. Perfect for a gathering of friends in the dreary days of winter….just the reminder we all need that spring is around the corner. 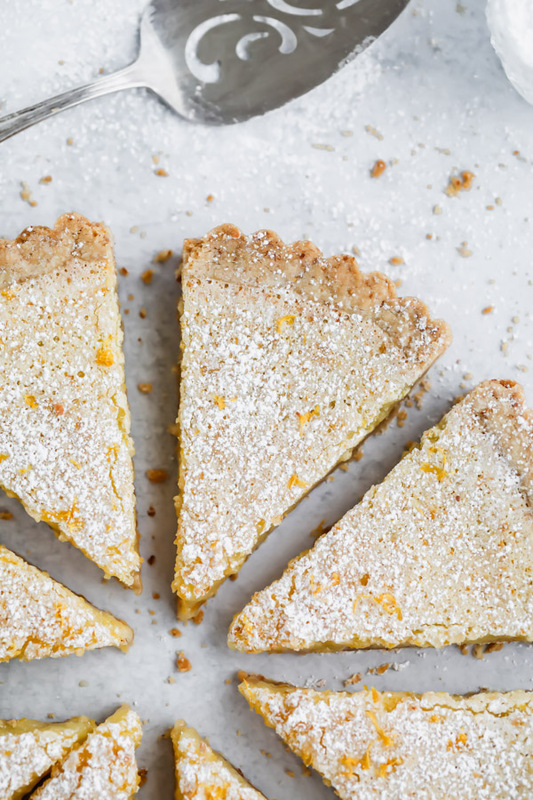 Not only is this tart pretty enough to serve to a crowd, but you get a bonus edge of thick shortbread crust by turning the classic bar into a tart. And this almond shortbread just might be one of the best things you´ll ever sink your teeth into. It´s sooooo good!! Don´t despair if you don´t have fresh Meyer lemons on hand. Any lemon will do but an extra trip to the store, or your neighbor´s tree [wink, wink] is well worth the time if you have it. To make this tart, you´ll need just a few simple ingredients and a 9 inch tart pan. I´m a big fan of this one from Sur la Table. They have a range of sizes and shapes so feel free to shake things up and make this tart into a square or rectangle. You do you! The crust comes together in no time by combining all the ingredients in a food processor. A few quick pulses and your crust is ready to be pressed into the tart pan. Bake the crust until just barely golden brown and then allow it to cool for a bit before adding the lemon filling. Once you pop it back in the oven, I suggest keeping a close eye on the tart as baking times vary from oven to oven. You are going for a set, but still slightly gooey center and a golden brown crust. Pro tip : cover the tart with foil for the last 10 minutes of baking if needed so as not to over bake the edges. Now for the hard part…to get these nicely cut edges you´re going to have to wait awhile for the tart to cool. I know, it´s basically torture but you´ll get through it. And it´s well worth the wait! Cool the tart on a cooling rack until room temperature and then send it off to the fridge for at least three hours or overnight. I actually prefer my lemon bars straight from the fridge. Bright and tart flavors are always best cold if you ask me. 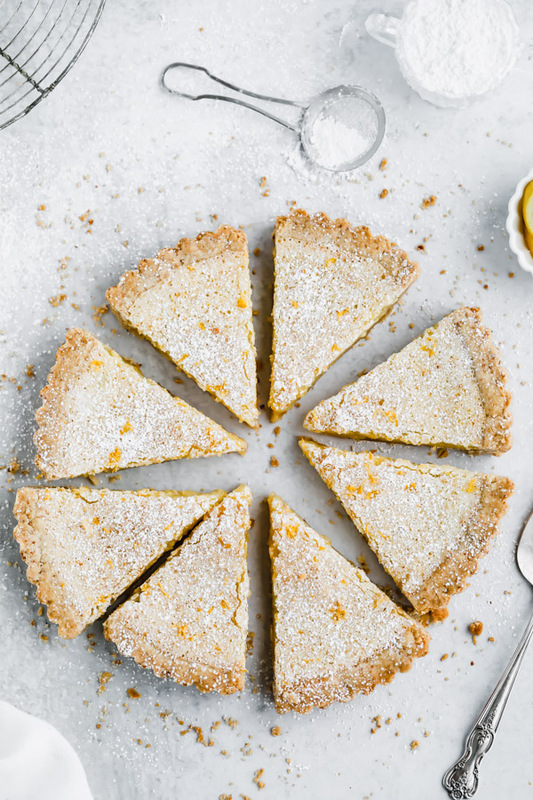 This Lemon Bar Tart is nothing short of refreshing! 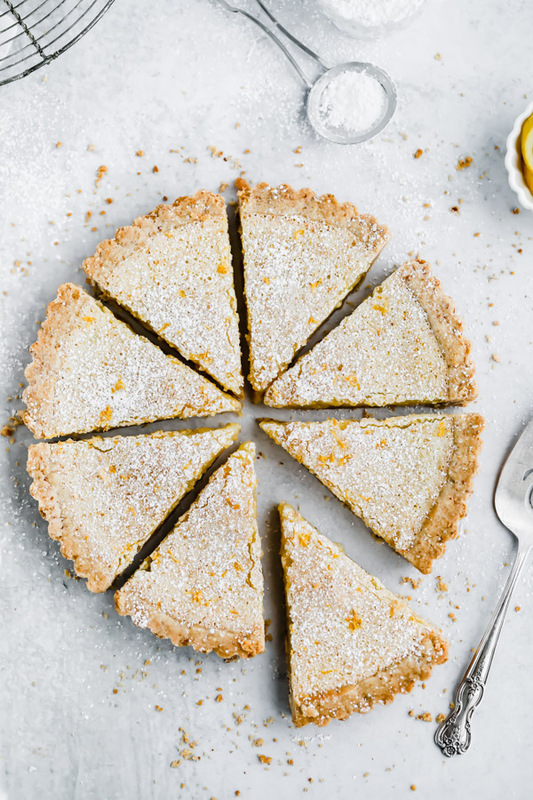 Looking at these photos is reminding me just how good this tart is so I´m going to sign off and go pick some lemons and make another tart just because. There wasn´t one single crumb left over from that dinner party. Make this tart and I think you´ll see why. 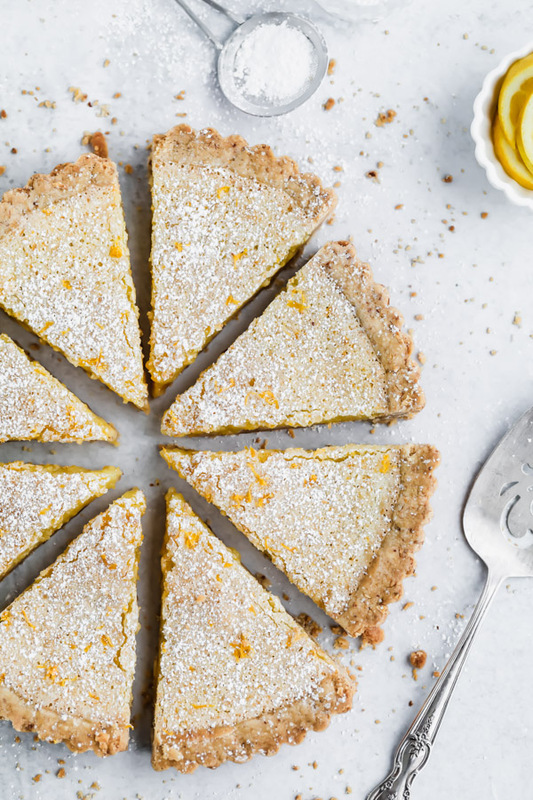 I hope you make this Meyer Lemon Bar Tart soon and if you do, be sure to tag @brownedbutterblondie on Instagram so I can see what you are baking up in you kitchen. 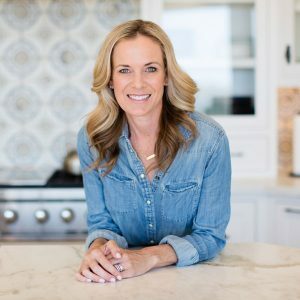 And don´t forget to follow along on Pinterest for all the latest recipe details straight from the blog. In the bowl of a food processor, combine all ingredients except the cubed butter. Pulse several times until mixture is combined. Add cubed butter and continue to pulse until mixture comes together into a ball. Press shortbread mixture into the bottom and up sides of a 9 or 10 inch fluted tart pan with removable bottom. Set tart pan on a cookie sheet. Bake for 8 to 10 minutes until every slightly golden brown but not fully set on bottom. In a medium bowl, mix together the sugar, flour, and baking powder. In a separate bowl, combine eggs, lemon zest and juice until smooth. Sift the flour mixture into the egg mixture and stir until fully incorporated. Pour the lemon filing into the baked tart shell still on the cookie sheet. Return the cookie sheet with the tart to the oven and bake for 30 minutes or until center is almost set and edges of crust are golden brown. Remove from oven and cool on cooling rack until room temperature. Place tart in the refrigerator for 3 hours or overnight. Dust with confectioner´s sugar. Slice and serve cold. Cooking time includes chilling time in refrigerator. Store left over tart tightly covered in refrigerator for up to 4 days. If Meyer lemons are not available, use regular lemons. I made this tart today and it came out great! I will be keeping this recipe and will make it many more times! Thanks for posting it! Yay! That makes me so happy!! Glad you enjoyed it.